There it is, folded on the coffee table. The newspaper’s culture magazine. Their annual writing contest with all winner’s works printed inside, just a few feet away from my shaking hands. I’ve submitted many times before, but feel this is the year I get published. I’m going to win because I took a chance. I didn’t send something I thought they were looking for. I do that every year. And lose. Instead, I sent an original, edgy, witty, and clever piece to the newspaper jurors. Adult Prose section, here I come. I open the magazine. Adult Prose First Place winner – not me. Okay. I wasn’t expecting First Place anyway. I turn the page. Second Place. Not me. You know, it would be nice, just once, if I won … anyway. I turn the page. Another writer has taken Third Place. But, wait – something new this year, the List of Finalists, names of writers whose works were considered extremely worthy but didn’t make the cut. If I’m on the list, some progress has been made. I wiggle my index finger down the page of ten names. Mike Andberg is not among them. Who are all these people? I’ve never heard of any of them. The Honorable Mention section. I flip the pages. Quickly. I have not been mentioned in the Honorable Mention section either. I check the Teen section winners. I never mentioned my age in my submission to the paper. Who knows? Maybe they placed my winning entry in the Teen category by mistake. I check it. Twice. My name’s not there. Teenagers are already in the paper and they’re, what, fifteen? I’m how old? I peruse the Kids category. Jesus. I mean, how good can these pieces be? I’m not included in this section (whether accidentally or deliberately). I envision tomorrow’s newspaper folded on my coffee table. A giant apology. It was all a printing mix up. Excluded from the Annual Writing Contest winners was Mike Andberg’s glorious, witty, funny, unique, and cutting edge piece. It could happen, right? I can only hope it wasn’t placed in Obituaries. Flowers bloom. Love blossoms. And dreams get crushed. Sometimes that’s what happens. Regardless, the power of spring’s beauty is such that hope springs eternal every year. Like this spring. And next spring. And every spring I’m alive. A particularly sweet spring – my sixteenth – occurred many years ago. The thrill of love, art, girls and winning combined for a lifetime worth of boyhood passion and intensity all in one season. I’m pleased to share that story with you from this excerpt in Chapter 5, “Artistry,” from my memoir, Maybe Boomer. I liked art class. It was different, a looser, free-flowing experiment in sociability as well as art media. The teacher often asked Maureen, a classmate one year behind me, to sit in a chair so the class could draw her, giving me the opportunity to stare at her freckles, low slung bell-bottoms, long brown hair, and exotic eyes. One minute, I fancied she liked me as more than the casual friends we were, the next minute not. Her penetrating smile always lured me in, either to bang my head against the wall in frustration or to try to get closer to her yet again. I was beginning to understand why the world associated love and art as inseparable, beautiful one minute, unsettling the next. In this class, learning to dabble in the love of art and the art of love occurred simultaneously, but the art of love took precedence. I hoped my fascination with Maureen might lead to something. Of all things, the attraction resulted in winning a Gold Key from the National Scholastic Arts Organization for a drawing I did of her in class. 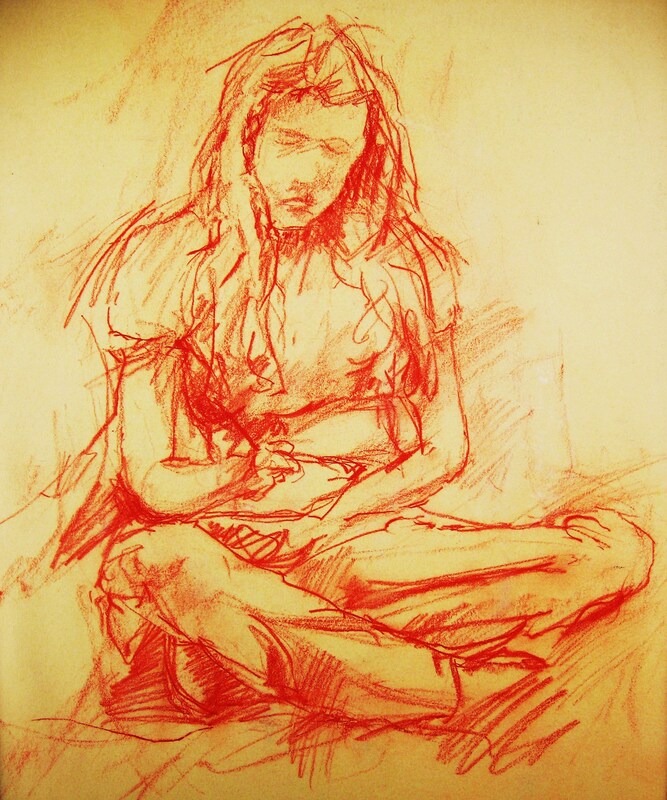 Using a fancy Conte’ a’ Paris pastel stick, I sketched Maureen as she posed in innocent, chaste fashion, cross-legged on the floor, writing in a notebook situated on her lap. Apparently, I’d also succeeded in shading her supple lips and tight shirt-covered breasts with a considerable amount of feeling – it sure got the judge’s eye. It was news of winning the Gold Key that got Maureen’s attention. That night, unannounced, she drove over to my house. When she said she came by just to say hi, I was flattered. When we proceeded to go out for ice cream, I was nervous. When we licked our ice cream cones while parked alone in her car, I froze. As we sat together in the front seat, looking out over the high school’s tennis courts, even my chilled hand couldn’t keep butter pecan from melting all over the motionless cone. Despite my statue-like position, thoughts and feelings raced through my mind, and I became oblivious to any signals she was sending. After thirty long minutes of only coming to know her car’s interior intimately, the right side of her face exclusively, and the uneasiness of love exactly, Maureen released me of my burden by reaching over and kissing me on the cheek. Oversensitive, thinking I’d been weak for not rushing the net to make the first move, I never recovered, never scored as much as a single point. Worse yet, I whiffed showing her any of my heartfelt affection. Forty-love; game, set, match. If words failed me, if touching scared me, if my own emotions threatened me, at least my passion had been comfortably freed to touch her through the segue of art. The memory of her would surely live on, but perhaps my greatest thrill came in creating a masterful work of art from my own hands for the first time, one inspired by Maureen.